Stay tuned for our latest Plumbing Newsletter. Simply subscribe to our BLOG for current information. Did you know - One of the leading causes of flooding to your home is due to a burst Stainless Steel Flexible Hoses. A flexihose generally has a lifespan of 5-10years, so ensure you check suppliers warranty. It is highly recommended that flexihoses are replaced after ten years. 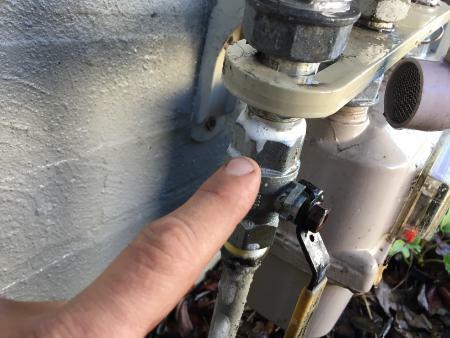 A visual inspection to check flexihose condition is reccommended every few months, and at 1st sign of rust, corrosion or hose kinks you should contact a licensed plumber to replace. Ensure that you when you purchase new flexihose it carries a W Watermark, which tells you it meets Australian Standards. It should also have thick braiding with good solid fittings. Keep cleaning products away from flexihoses, as chlorine dissolves in humidity and forms hydrochloric acid which is highly corrosive, This increases the risk of flexihose corrosion. If you have high water pressure, it is recommended to install a pressure limiting valve, so less pressure is placed on the flexihose. 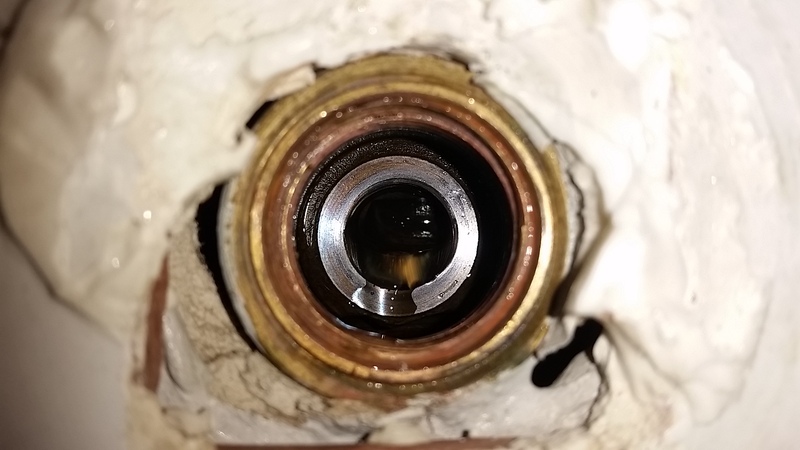 If you have water hammer present this will put extra pressure on the flexihose, so it is highly recommended to fix the water hammer issue immediately. We would also recommend all homeowners to check your insurance policy to ensure your insurance policy does not excude losses arising from flexi hose failures. 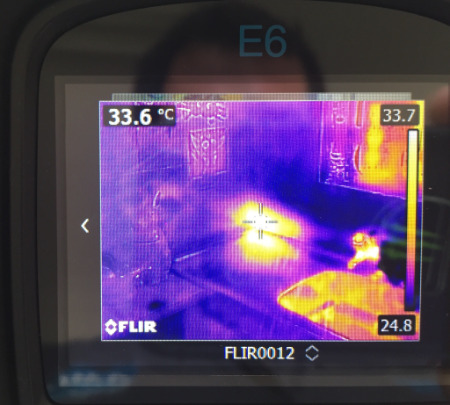 Amps pride ourselves in keeping up with the latest technologies and have recently purchased an infrared thermal imaging camera. As you can see from the images below, we are able to pinpoint hot water leaks within wall cavities, roof spaces and under concrete slabs. Repair works can then be carried out quickly with minimal damage to the premise. The good news is you will spend less on labour and materials to carry out repairwork to the affected area. 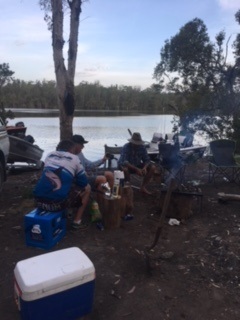 Every year our team, attend our annual fishing trip travelling north to the Karuah River, where the competition begins!!! 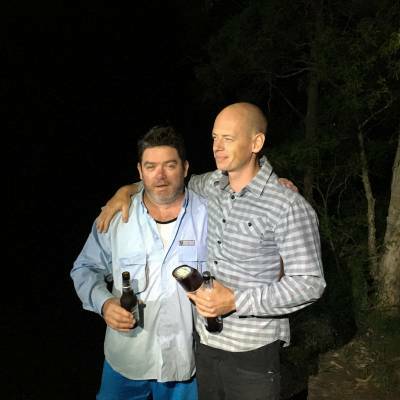 This year Ben took out the title, catching a 67cm flathead, and as usual it was great to get our team together for a night camping on the river. Notify fire brigade and shut down water. 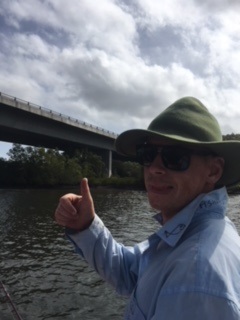 Link with old existing service. 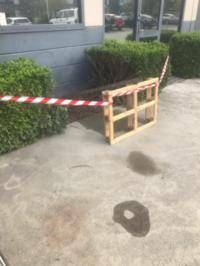 Upon arrival to the job of the week, it was pretty clear that we would need the water leak detection equipment, so we could directly pippoint the exact location of the leak, and therefore minimise the damage to the pebblecrete driveway. 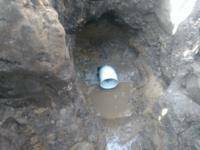 In this case we were able to determine that it was on the main cold water pipe 250mm below the driveway. We marked the location with an X. 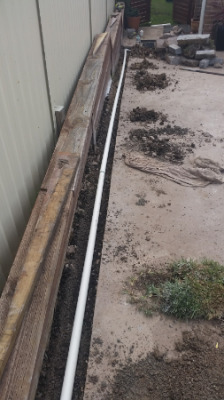 We then proceeded to cut out a section of driveway where leak was present and located the leaking section, the damaged section was cutout and replaced with new. We then proceeded to backfill the area and tested the water supply, and re-concreted. AMPS Plumbing have a team of specialised plumbers for all types of jobs , big or small!!!!! We are available 24 hours a day, 365 days per year. 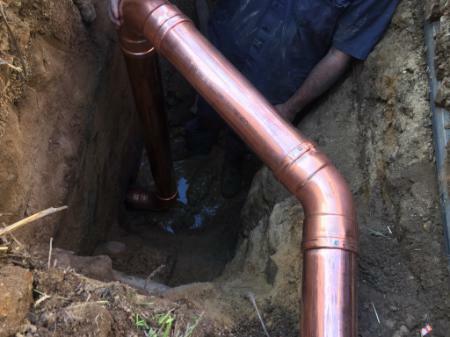 So the next time you are faced with a plumbing problem, give us a call on 4367 0011. The Benefits of Pipe Re-Lining. 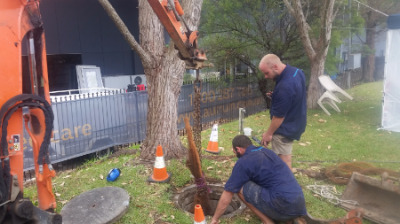 Pipe Re-Lining can be used to repair damaged pipework on Sewer and Stormwater Lines, due to collapsed drains, Cracked Pipes, Ground Movement and Tree Root Intrusions. Cost effective - cuts down on labour intensive digups and also additonal costs to repair driveways, pathways or fencing. Less Invasive - seclusion zones can be kept to a minimum as the work in generally carried out underground. Extends Life of Pipework - the relining product is extremelely durable and will increase the pipworks lifespan. Enviornmentally Friendly - Reduces site waste and there is no disruption to the land with heavy machinery. 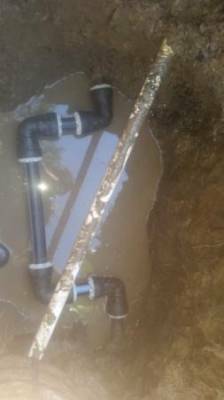 Improved Water Flow - The relined pipe is smooth with no chips or flakes that could cause blockages. 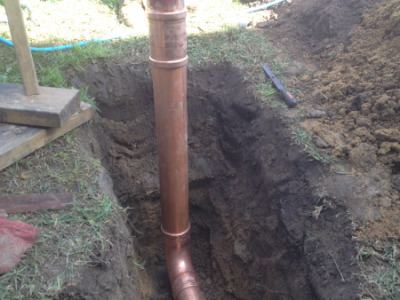 If you would like to discuss Pipe Relining options please contact the Amps office on 4367 0011 to discuss. Last week we carried out a re-run of the fire service, at a large hospital on the central coast. Due to the location of the leaking fire service, it was far more econimical to re-run the line, to bypass the trouble section of pipework. We were also able to keep a large section of pipework exposed so that repair work in the future is easily managed and cost effective. Amps have had 25+ years experience on the central coast, and we will always endeavour to come up with the best and most cost effective solution for all your Plumbing needs, big or small!!!! Job of the week started with notification that a tennant had reported a strong smell of gas present at her home. Carrying out the initail investigation revealed the ball valve had a small leak present that needed attention, whilst repairing ball valve one of the unions on the meter bar cracked, so we also replaced the meter bar. 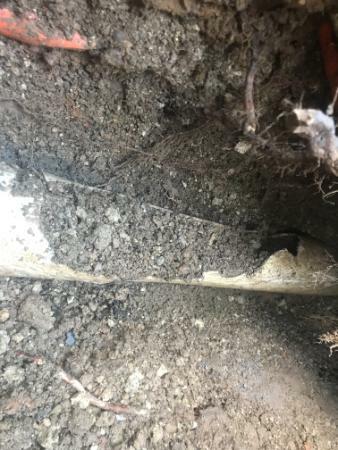 Upon further testing we found a gas leak was still present, so then excavated down to the copper where we found the nylon connection was cracked and leaking, this leaking section was then replaced. Gas Leaks can be dangerous and tricky due to its unpredictable nature and should always be left for the professionals!!! 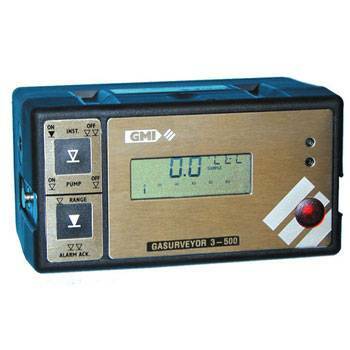 We use the latest technology to locate gas leaks, so give AMPS a call today..... 4367 0011. Repair of Damaged sewer line under concrete driveway. 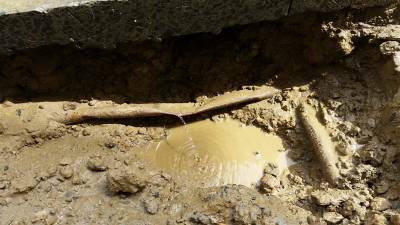 JOB OF THE WEEK : Repair of Damaged sewer line under concrete driveway. 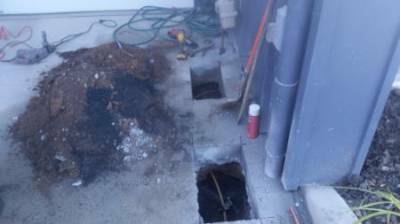 This week we attended a job that had reported a blocked sewer under a concrete driveway. We firstly attempted to clear the sewer line with the High pressure Water Jetter, but in this case we were unable to clear. We then proceeded to carry out a CCTV camera inspection, where we quickly found that there was a crack in the pipe, which had been caused by installation of electrical conduit. (see image below). 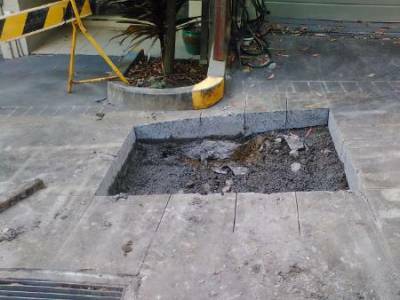 The CCTV camera inspection also enabled us to pinpoint exact location, advising that the break was 600mm long and 650-900mm deep underneath the concrete driveway. 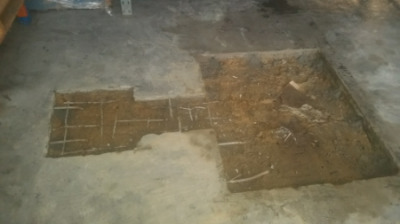 Excavated the ground to expose the faulty pipework. Removed rubish and left site clean and tidy. 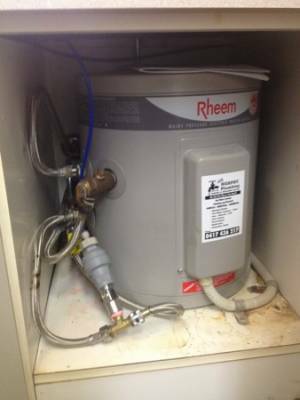 This week we received an emergency call to a busy nursing home which had lost all hot water. Our plumber was able to attend immediately outside of standard business hours. Upon inspection we found a large hole in the base of the gas unit, which was leaking water profusely. 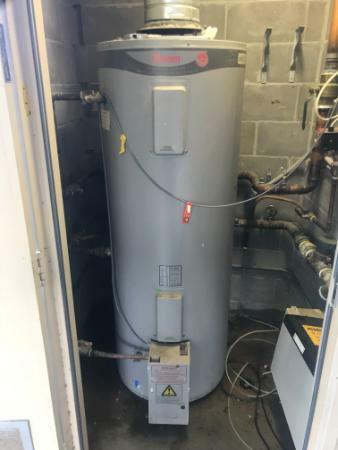 In this case there was no option but to replace the unit, so this was completed within a few hours, and hot water was restored to the staff and residents of the nursing home. 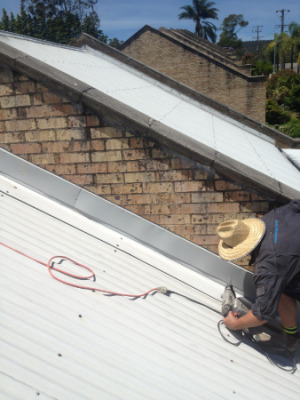 The job of the week consisted of Supply and Installation of 40 meters of box gutter replacement due to corrosion of existing guttering over time. Cut out and removal of parapet and top cap flashings. Supply and install of new stainless steel box guttering and flashings. 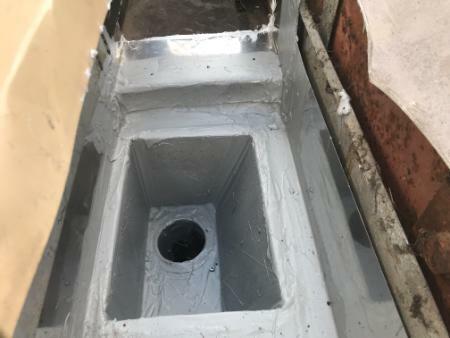 Supply and install new box gutter sumps, overflows and stop ends. Remove Rubbish and leave site clean and tidy. This week we attended a job to carry out an inspection on a leaking water meter. 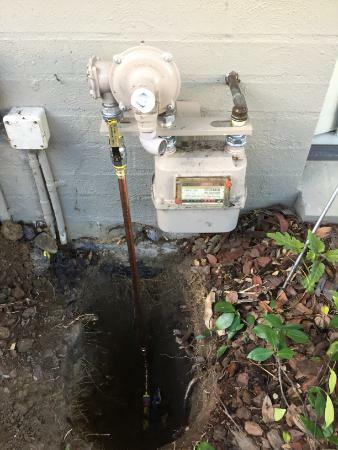 The leak was found to be located between the water meter and pressure limiting valve. We excavated area to reveal damaged section and replaced failed cap with brass capping. For all your plumbing needs call the experts at AMPS Plumbing on 4367 0011. 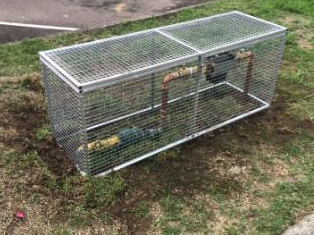 This week we carried out installation of new RPZ Valve, and surrounded with Metal Cage to avoid vandalism, theft or accidental damage to the valve. 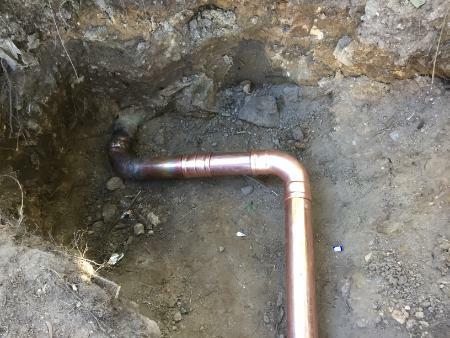 * Excavated water service in ground and exposed the pipe work. * Shut down the water supply and cut the valve into place. * Filled and tested the valve. * Poured Concrete and leveled area. 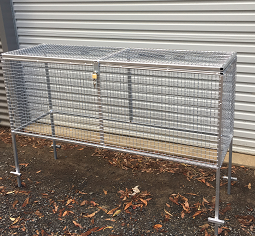 * Returned following day to install secure cage. * Removed rubbish and tidied site. 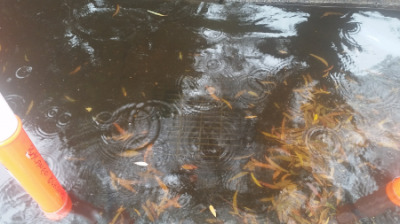 Our client was experiencing massive issues with Storm water Drainage, which would result in flooding of property. Electronically line traced the under ground power lines. Cut out asphalt strips and excavated area. Formed up and poured 2 road crossings with steel re-inforced drains. Carried out CCTV camera inspection to ensure all existing drains were clear and flowing. Installed a 2.5 strip drain in driveway. Excavated across the large grassed area to the East of the proposed strip drain installation , to make connection into the stormwater. Site left clean and tidy. 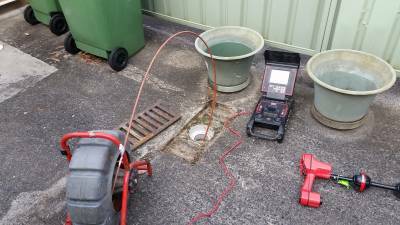 Amps Plumbing are the Central Coasts experts in finding solutions for you all your drainage issues. There is no job too big or small for us, so why not give us a call today and speak to Cam in the office on 4367 0011. 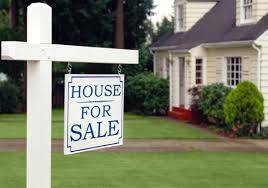 Are you buying a new home????? Buying a new home can be stressful and the last thing you need is expensive plumbing repairs when you move in. So by being proactive you can eliminate the risk of unexpected costly repairs, when you need it least. 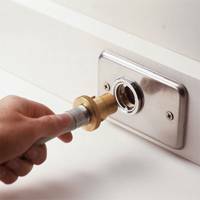 By carrying out these checks when carrying out inspection you will get a good insight into the plumbing condition of the house. * Flush the toilet to make sure it is flushing efficiently. * Check drains by testing sinks and basins by filling and checking that the water drains quickly when you let it out. * Check taps and showers for good water pressure, and that no loud banging occurs when taps turned are turned on. * Check for water damage on interior and exterior walls. * Wet patches outside that could indicate broken pipework. * Check guttering and down pipes are in good repair. If you would prefer to leave it to the professionals, call AMPS PLUMBING on 4367 0011 and let us check it out for you. 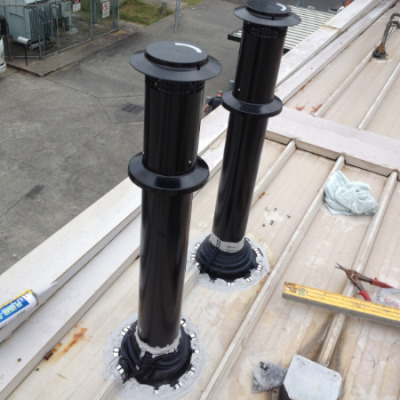 This job of the week consisted of installing a 2000 litre Grease Arrestor on a commercial premise. 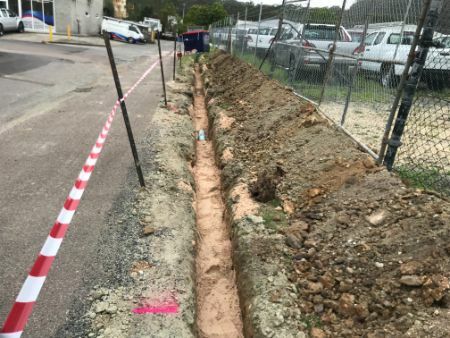 The work carried out consisted of Excavation, Installation of Grease Arrestor, fitting off back flow valve, connecting surcharge gully and excavating trench to to connect to existing sewer line. Once completed we re-concreting area leaving the site clean and tidy. Our team of plumbers have the experience and knowledge to carry out any plumbing jobs, big or small both in the residential and commercial sector. 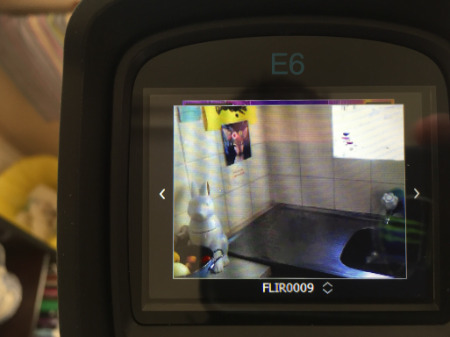 AMPS PLUMBING ARE EXCITED TO ANNOUNCE THAT WE HAVE RECENTLY ACQUIRED A NEW STATE OF THE ART CCTV CAMERA, WHICH WILL ALLOW US TO OFFER AN IMPROVED SERVICE TO OUR CUSTOMERS. The new equipment will not only allow us to produce a crisper, clearer image of the damaged pipework , but also has the ability to digitally record pipe inspections upon request. 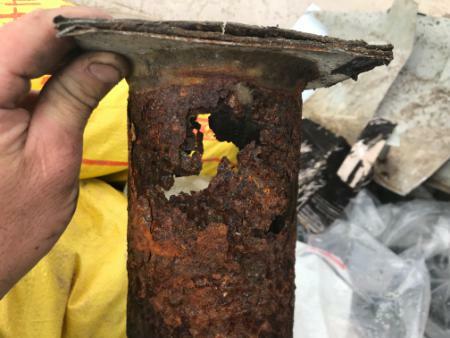 This will allow you as a customer to watch and see for yourself the condition of your drainage/sewer system, so will eliminate any uncertainty of the condition of what is not visible to the naked eye. The images or digital recording can be emailed directly to you if not on site. 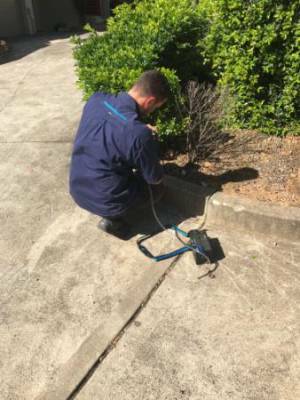 Here at AMPS we are always looking at ways to improve our service to our customers, so if you have any doubt of the condition of your drainage system then call Cam in the office today on 4367 0011. 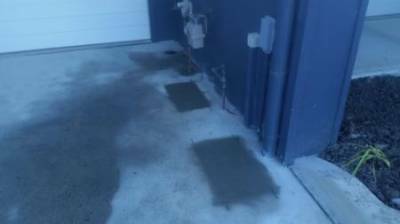 This week we attended a job where there was a leak under the concrete driveway. 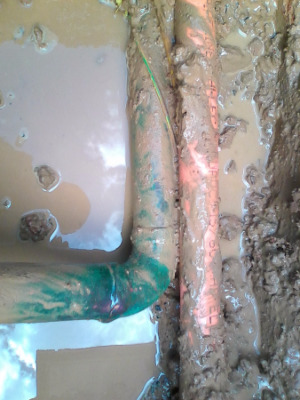 We firstly used our Electronic Leak Detection Equipment to quickly pinpoint the location of the leak. We then cut out section of concrete to access the area and excavated to quickly find the broken 50mm poly fitting. 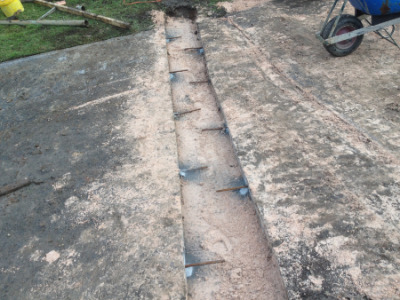 We replaced the damaged section, re-concreted and cleaned the site. Here at AMPS Pluming we specialize in all plumbing maintenance jobs, and pride ourselves on leaving the site clean and tidy afterwards. Give AMPS a call today!!!!! Do you have a water leak, and not even know it!!!!!!!! 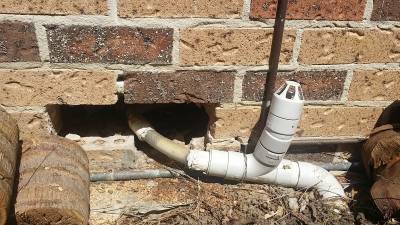 Have you got a water Leak in your home and not even know it???? We regularly receive phone calls from customers saying they have a massive water bill and aren't sure why!!!! 1. 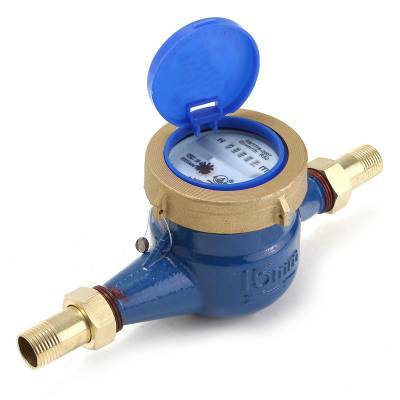 Take your water meter reading. 2. Wait at least one hour and make sure that no-one uses any water during this time. 3. 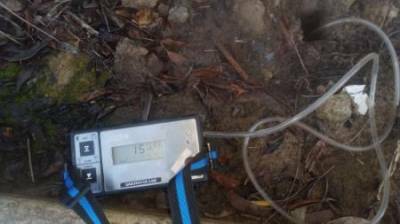 After one hour check your water meter again. It really is that simple!!!!!! If your water metre has changed or you can physically see your water meter ticking then you need a plumber. 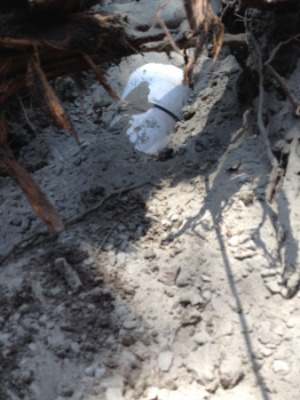 Job of the Week - Tree Root Intrusions on Sewer Line. 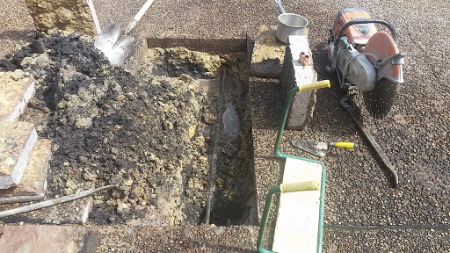 This week we attended a job where the use of our CCTV equipment enabled us to quickly pinpoint three separate area's on a property where the tree roots had caused extensive damage to the existing sewer lines. * Removal of all rubbish from site. * Leaving site clean and tidy. This week we attended a job where the occupants had reported a strong smell of gas at the front of the property. We carried out a full Investigation using the latest in gas leak detection equipment, and were able to quickly confirm that there was in fact a gas leak present. We located the leak under the concrete driveway. We cut out a section of driveway tracing and checking the copper pipe for any faults. 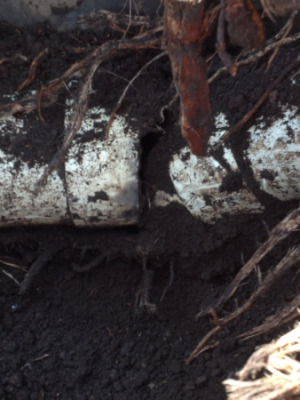 We located and cut out the leaking section, repaired and insulated around the pipe. Testing was then carried out and the concrete driveway repaired. 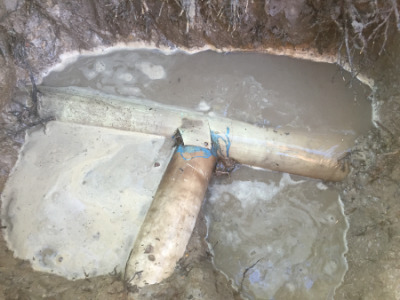 This week were called out to job where we quickly located a cracked sewer shaft, we excavated around the shaft to expose pipework and replaced the damaged section. Here at AMPS we are available 24 hours a day, 7 days a week for all your plumbing needs - big or small. 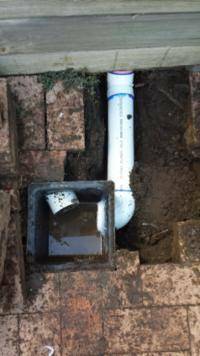 Job of the Week - Storm water downpipe repair. 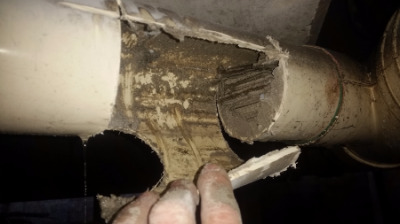 A CCTV camera inspection on this job revealed that there was a damaged section of pipework, which was causing internal wall damage to the property. * Number and lift the necessary pavers above the broken pipe area. * Excavate under the patio to expose the broken pipe. * Cut out pipe and replace. 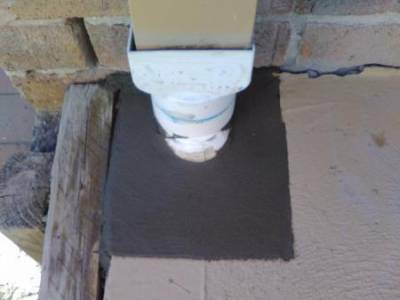 * Support downpipe in concrete to prevent future damage. * Back fill and re-lay the pavers. * Leave site clean and tidy. Here at AMPS there is no job too difficult, so for all your plumbing requirements give AMPS PLUMBING a call today on 4367 0011. 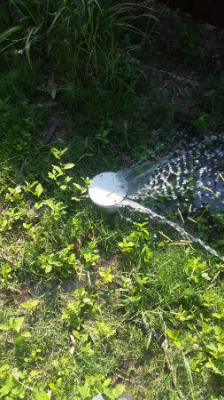 This week we were called out to a job as there was water pooling around the telecommunication box at the front of the property. Investigation revealed a leaking poly fitting on the cold water pipe. We firstly had to turn off mains and using a sump pump we cleared the water so repairs could be carried out. We then proceeded to replace poly fitting and reinstated the water supply. Testing ensured that no further leaks were present. 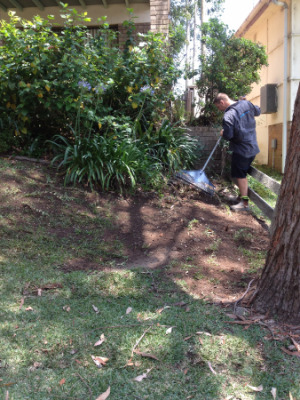 Remove and dispose from site, shrubs & bushes in the way of the excavation. Excavate a trench 500 mm wide, the full depth of the retaining wall and the full length. 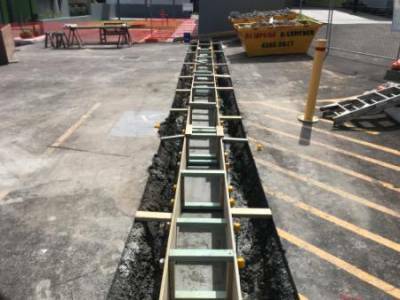 Supply and install a twin x 100 mm PVC slotted ago line, at the base of the retaining wall, to discharge into a 400mm storm water pit. 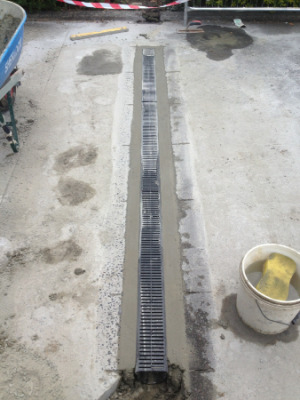 Install a 100 mm slotted ago line, from storm water pit. Back fill the excavation with clean 40 mm aggregate to finished ground surface. Grade the excavated area and leave site clean and tidy. Shut down the gas feed to the complex. Core hole above each leak to allow the release of gas to occur. 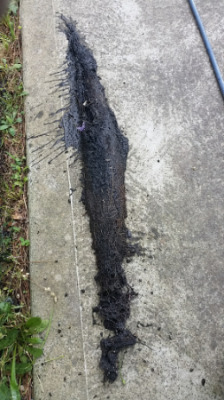 Cut sections of driveway with leaks present. Re - pour new concrete. 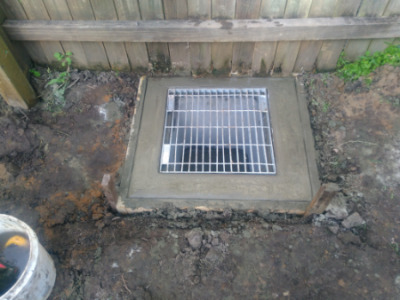 On this Job of the week, we carried out the excavation and installation of a new concrete pit, as the owners were experiencing flooding due to rainwater run off from the surrounding area each time it rained. If you are having issues with flooding or water pooling than give AMPS PLUMBING a call today. Our plumbers have years of experiencing in finding a plumbing solution for all possible scenarios. Dig trench ensuring correct fall is achieved. 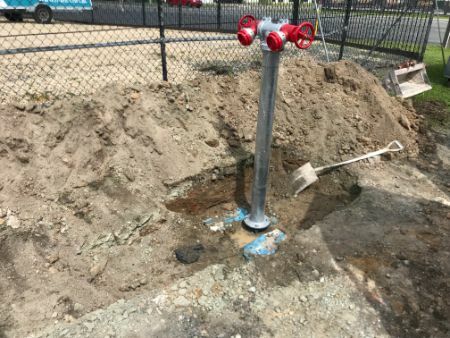 Installation of new pipework and attach to existing stormwater pit. Re pave area and remove rubbish. If you are having issues with water pooling in around your home, then call AMPS Plumbing and we will help you come up with a better solution!!!! AMPS Plumbing is excited to advise our customers that we have recently invested in an underground Gas Leak Detector, which will enable our experienced team of plumbers the ability to quickly locate gas leaks underground with care, efficiency and precision. Gas Leaks if left unattended can in some circumstances be catastrophic, so don't take the risk to the health and well-being of your family, friends or co-workers. 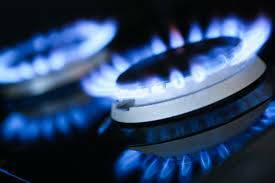 Gas related work is best left to the professionals, so give AMPS a call today on 4367 0011. 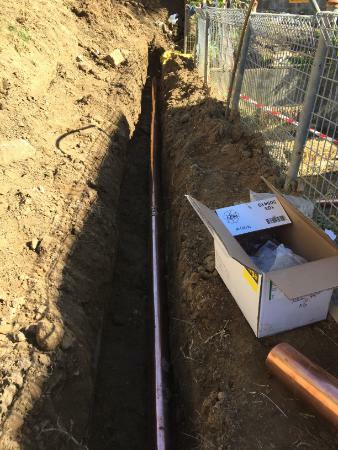 Job of the week consisted of carrying out a detailed CCTV Inspection to locate sewer main and pipework before commencing with major excavations on sight. We firstly ran the camera down the line and then used the locator which traces the camera and accurately measures the depth, and position of pipework. Our professional plumbing team using the latest technology in tracing equipment can locate all your services on your property with ease. 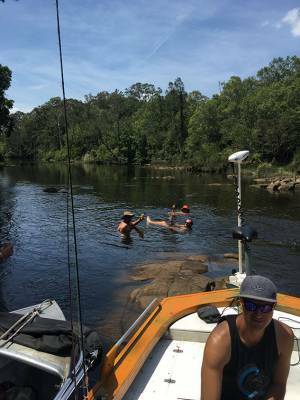 So If you are installing a swimming pool or considering renovating then call in AMPS PLUMBING today on 4367 0011. 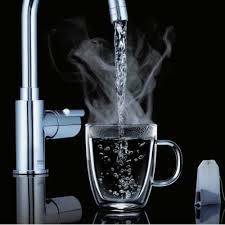 Have you ever thought about installing a water filter in your home or office???? 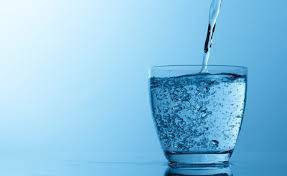 Water Filters are devices that remove contaminants and impurities from water through a chemical process. Toxic substances that are removed could include parasites (such as Giardia), bacteria, algae, fungi and also man-made chemical pollutants. Your water will instantly smell and taste better and you can also ensure the health and safety of your family. AMPS PLUMBING have a fully qualified team of professional plumbers servicing the entire Central Coast 24hrs a day, 7 days a week. Call Today on 4367 001. 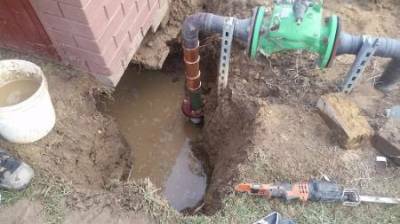 Our client on this job was experiencing a blocked sewer within the main sewer line. 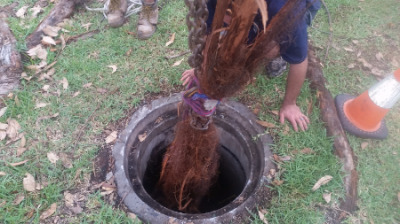 Immediately we were able to see the cause of the blockage was a massive tree root which had found its way into the sewer line. We needed to call in for extra help on this job and by using our excavator we were able to lift the root system out of the sewer line successfully. As you can see from the photo's it was HUGE!!!! 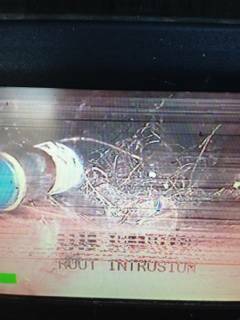 After the tree root removal we used our CCTV camera to see what else we were dealing with, and by using our high pressure water jetting equipment we were able to fully clear the line successfully. 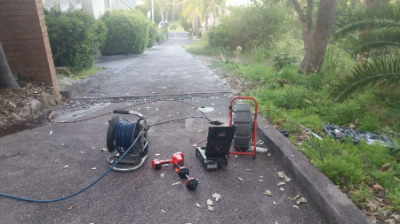 Here at AMPS PLUMBING we have the Latest Equipment, Knowledge and Expertise to clear any blocked drain with ease, so call us Today on 4367 0011. Have you ever considered Installing an Outdoor Shower???? Outdoor showers can be installed on rooftops, balconies, gardens or even on the facade of your home. * Sunny position - this will eliminate the possibility of rotting materials, and the bulid-up of mould in shower area. * A firm level surface is required that can withstand water and foot traffic. * Use of shower - whether it will be used for washing sand off after trips to the beach, washing dog, or bathing. Once you have considered all of these options, you are ready to go!!!! So why not call in the expert plumbers at AMPS PLUMBING we can make it happen!!! Call Today on 4367 0011. 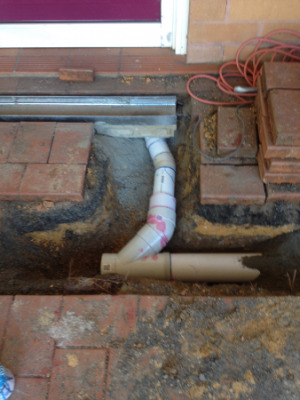 Job of the Week - Burst Water Line under existing driveway. 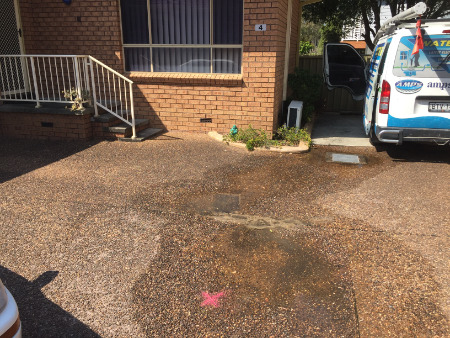 On this job we were quickly able to establish exact location of water leak beneath the existing driveway using our electronic leak detection equipment. By finding the leak quickly and efficiently we are able to save both our Plumbers time and our Customer Money!!!!! This job then consisting of excavating, repairs to pipework and back-filling leaving area clean and tidy. 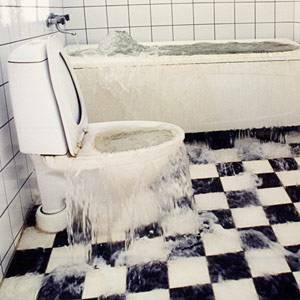 So be sure to call in the expert Plumbers at AMPS PLUMBING next time you have a water leak in your home or business. 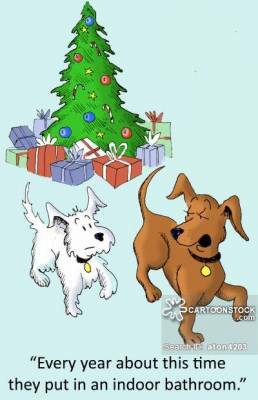 VERY MERRY XMAS AND MAY 2017 BRING YOU ALL GOOD HEALTH, HAPPINESS AND LOADS OF LAUGHTER!!!! 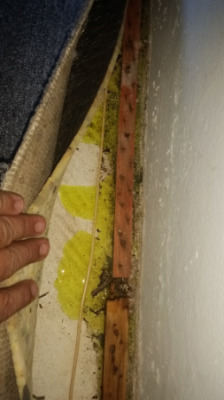 During the week we attended a job where we inspected and carried out a flood Test on a balcony that the owner suspected was causing water leak issues within the block of units. 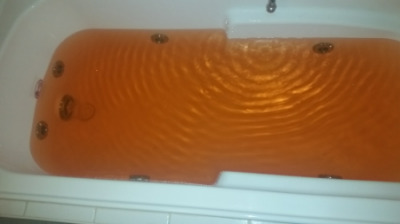 Undertaking the dye test we were able to eliminate the balcony as the cause of the water leak. 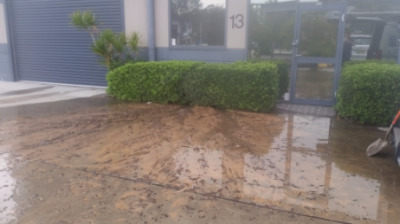 If you suspect water leaking in your home/unit or office then be sure to give us a call on 4367 0011. There is no job too big or small, and we are available 24 hours a day, seven days a week. 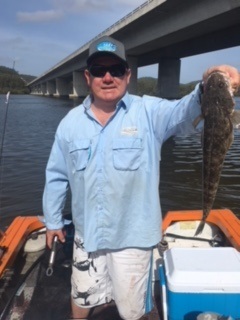 Servicing the Entire Central Coast of NSW. 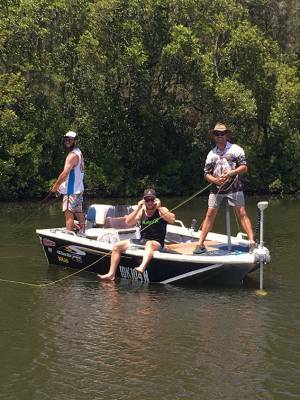 Last week our team went on their annual fishing trip, travelling up to the Karuah River where the hotly contested fishing competition was taken out by Ben. Good times were had by all, with plenty of memorable moments thrown in. Thanks Boys for a great time!!!! Washing Machine Leaks, and Tips to avoid a DISASTER!! TIPS TO AVOID DISASTER IN YOUR LAUNDRY. Laundry Spaces are generally located in close proximity to our kitchen /living space these days for modern day convenience. We can put a load of washing on whilst dinner is cooking. 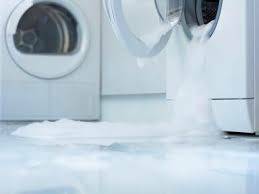 So generally if your washing machine springs a leak mid cycle it could be a disaster and damage costly furnishing and electronic equipment in your living room/kitchen spaces. * Consider replacing plastic and rubber hoses with steel braided ones, as they will last longer. 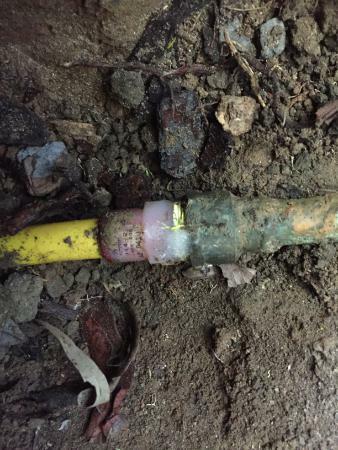 * Check your hose connections every couple of months to make sure they haven't come loose over time. * Turn off the water supply to your washing machine when not in use. * If possible you could replace screw type valves with dual ball valves. * Avoid walking away whilst filling up your laundry tub, it is easy to get distracted and forget that the tap is running. 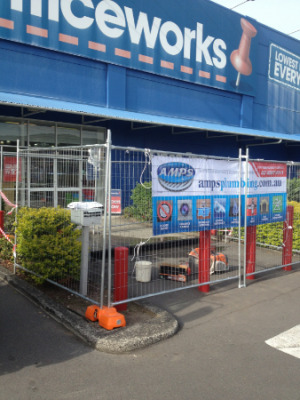 AMPS Plumbing are the experts in all thing plumbing so call us Today on 4367 0011. 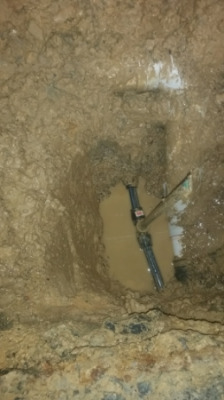 On this job we used our leak tracing equipment to locate The Mains and existing pipework. We then excavated and replaced back flow prevention devices to the main water feed, meeting all current Council requirements. Our plumbers have the knowledge and experience for all your plumbing needs BIG and SMALL, so call AMPS PLUMBING today on 4367 0011. We all need a little laughter in our week, so here goes!!!! Question : Why did the plumber start to dance??? Natural gas is one of the most popular methods for heating, cooking and hot water systems, so why not extend this to our outdoor BBQ"S as well. Natural gas will never run out, so the next time you have friends over for a BBQ you can be certain that you won't be halfway thru cooking and the gas runs out!!!!! Natural gas is cleaner burning than LPG, which makes it more enviornmentally friendly. Most BBQ's today are designed to be used with LPG cylinders, so it will need to be converted to be used with LPG gas. 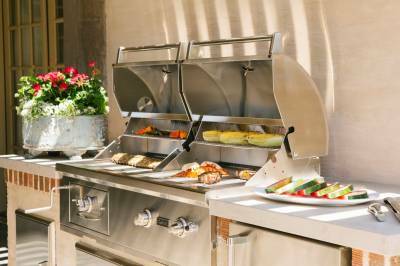 For a BBQ to run on natural gas it requires larger jets, a suitable regulator and an adjustment of pressure. This job should always be performed by a licensed plumber, to avoid a catastrophic disaster if not installed correctly to specifications. So call in the Expert Plumbers at AMPS PLUMBING, we would be happy to quote and advise on the conversion costs associated with this. NOW'S THE TIME!!!! 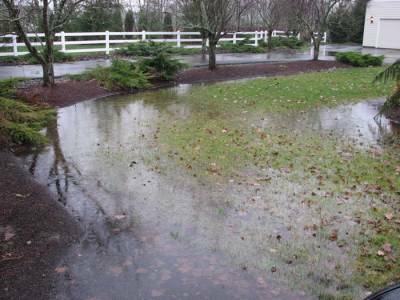 TO CHECK THAT YOUR DRAINAGE SOLUTIONS ARE EFFICIENTLY ABLE TO DEAL WITH THE AFTERNOON SUMMER STORMS THAT OUR HARSH CLIMATE DELIVERS. It is important to regularly inspect your downpipes, guttering and stormwater run-off to ensure that rainwater is efficiently flowing away from your home. If it is not adequate it could potentially do costly damage to your home. 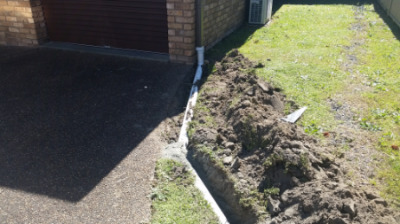 This week's job of the week was a replacement of pipework from the downpipe of the garage to the drain located at the front of the property. 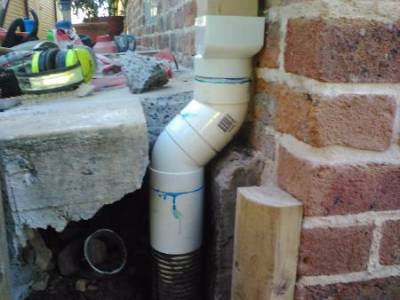 If you have any concerns about your existing drainage solutions than let the Expert Plumbers at AMPS PLUMBING help you!! 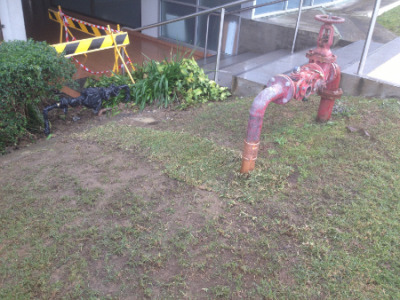 This week we were called to a unit block where the storm water lines seemed not to be working effectively. 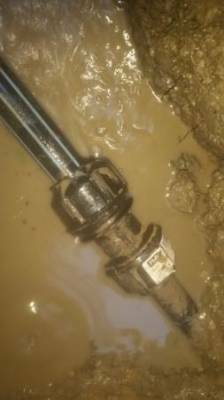 We firstly used our high pressure water jetter down the lines which would clear any debris buildup, but this proved not to help the situation, and the blockage remained. 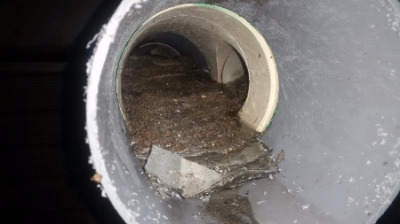 We then proceeded to use our CCTV camera to check the pipework, and to our surprise we found a cement buildup in approxiametely 20 meters of pipework. In this instance the sheer volume of concrete buildup meant that a large section of this damaged pipework needed replacement. It is never a good idea to dispose of concrete or other setting agents down drains, your best option is to read the manufacturers guide on packaging as they will usually give you alternative solution to disposal of the substance. 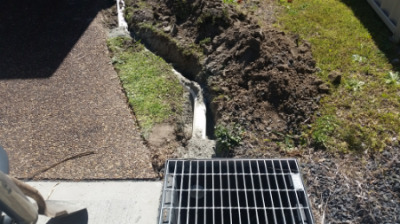 If you are experiencing a blocked drain, then call in the plumbing experts at AMPS PLUMBING, we service all areas of the central coast 24 hours a day, 7 days a week. Call Today!! This week we were called to a job where the client noticed that the carpet at the entry to the bathroom was wet. 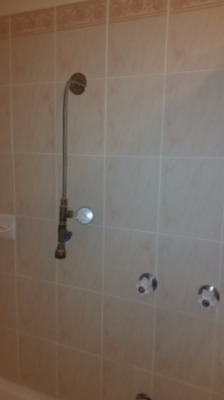 We carried out a pressure test on the shower, which indicated a leak present in the wall cavity. We removed a section of the gyprock to gain access to pipework, where we quickly discovered a leaking soldered joint. 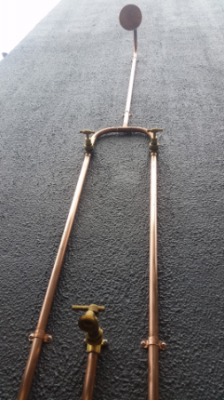 We replaced the section of copper pipework, and pressure tested to ensure that all was working well. If you suspect a water leak in your bathroom, call AMPS PLUMBING on 4367 0011. 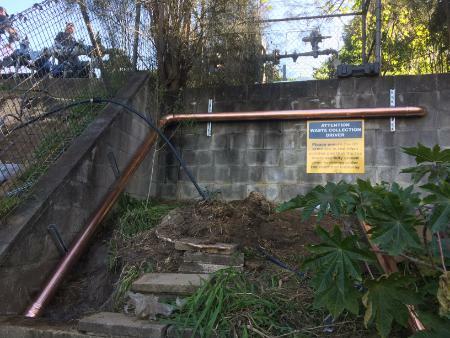 This week we were called out to a job where tree root intrusion had caused damage to pipework in the storm water line, we removed the tree roots and replaced the section of damaged pipe. For over 20 years AMPS Plumbing have specialised in the clearing and maintenance of Blocked Drains. 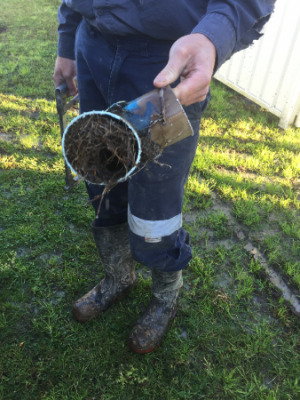 During this time we have gained vast experience in the industry, which has enabled us to predict with certainty that without preventative maintenance or a change in circumstance (ie tree removal) that a tree root affected pipe blockage is 95% likely to re-occur within 1- 3 Years. 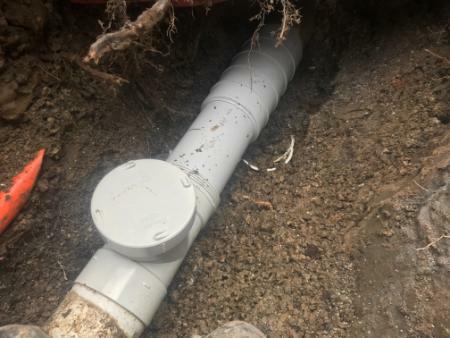 If you have concerns that you have a water leak or damaged pipework due to tree-root intrusion, then call in the plumbing professionals at AMPS Plumbing, as we use the latest in water leak detection systems and CCTV Cameras to check for any issues. On this job, the pipework to the fire service was badly corroded and leaking, due to the age and material of the pipework. 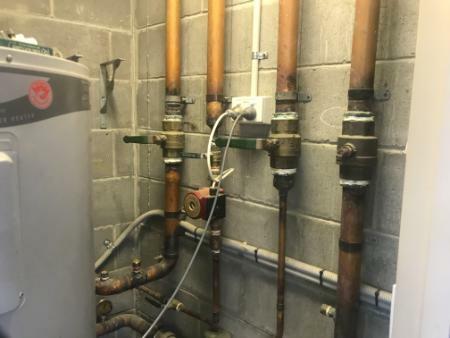 With our years of experience in the industry we knew the best solution in this instance was to fully replace the pipework, so our customer could avoid costly problems and plumber call out fees in the future. 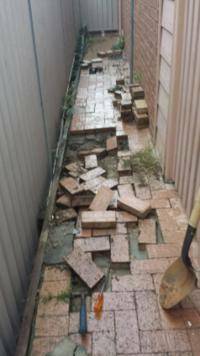 Removal of existing concrete walkway. Removal and replacement of pipework. Fill and Test the Line to ensure all working well. Remove rubbish and leave the site clean and tidy. AMPS Plumbers will always work with you to come up with the best solutions for all your plumbing needs, so give us a call today on 4367 0011. 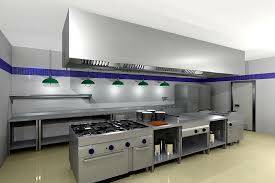 There are many things to consider when planning a commercial kitchen setup or re-design. 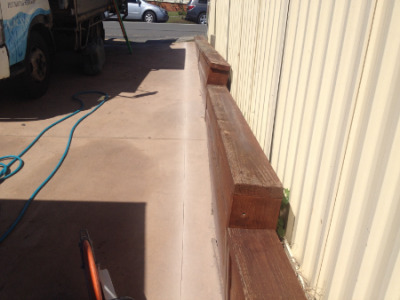 AMPS Plumbing have been servicing the entire central coast for over 20 years. During this time we have gained valuable knowledge to produce custom solutions to your specific needs in the commercial kitchen, cafe or restaurant. 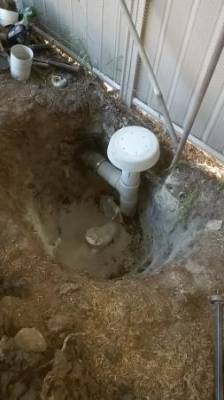 Do I need a greasetrap installed? If there is an existing greasetrap does it meet council regulations, and is it of adequate size for the premise? Do I need a floorwaste in the coldroom, and how big should it be? What sort of tapware is suitable? Is a water filter needed for my appliances installed? 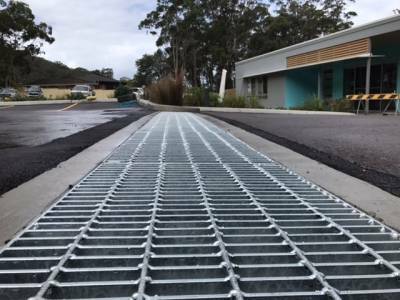 Is a bucket trap required in the floor waste grates? Do I need a basket waste in the sink? Hot water requirements. What is the best Solution? So whether you are setting up a new kitchen or re-designing an existing one, it is important to get it right the first time round!!! AMPS Plumbing would be happy to help you meet with current regulations, and also have a functional working space where staff can work to there optimum. 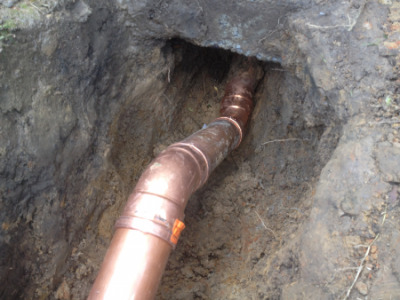 This job consisted of a re-run of water service to the Main, after a burst pipe was located under the main driveway. 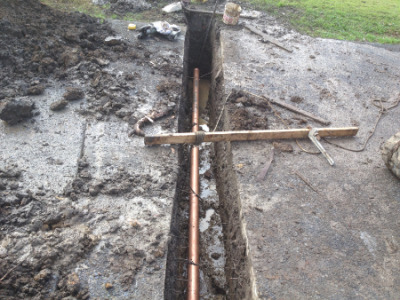 We had to cut and excavate a new trench to install a new section of pipework to the existing water main. Fill,Test and re-concrete leaving the site clean and tidy. Our experienced plumbers have the knowledge and experience to come up with a solution for all your plumbing needs. This week we were called out to a job where the roof storm water wasn't running off the roof efficiently, which was causing internal damage to the ceiling for our customer. We firstly attempted to use the latest technology and water jetted the pipe, which was unsuccessful in rectifying the problem. 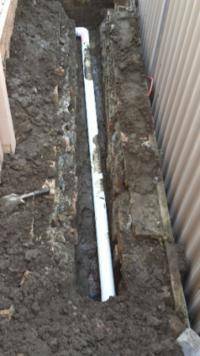 Our plumber was then able to pinpoint the location of the damaged pipe and replaced the damaged section, leaving the site clean and tidy. 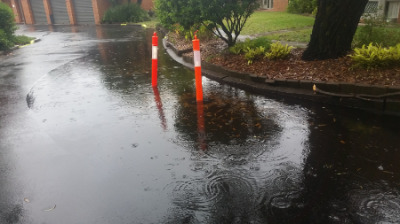 If you notice that water is pooling on your roof then give AMPS PLUMBING a call, we specialise in blocked drains and drainage solutions for all scenarios around your home and property. 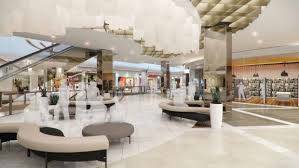 Do you own or manage a commercial Property??? It could be a shopping centre, group of units, retirement village, whatever the business!!! If it relies upon continual operation with zero down time than AMPS PLUMBING can be relied upon to deliver regular plumbing and gas services to ensure 100% reliability. Using the latest technology available in the plumbing market, allows us to quickly detect any problems, diagnose and repair any works that need to be done. We offer 24 hour emergency plumbing which minimizes the direct impact to your customers and loss of potential income. As most property owners and managers know it is much safer to be on top of any blockage before it becomes a disaster for your business. 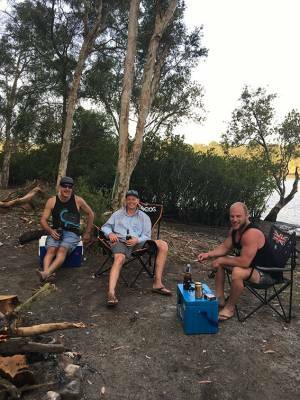 AMPS PLUMBING have been in operation for over 20 years on the central coast, specializing specifically in emergency based and commercial plumbing. So why not call us today on 4367 0011. Now is the perfect time to make sure your roof in in good working order. A buildup of leaf matter over the colder months can cause major damage now the winter rain has set in. 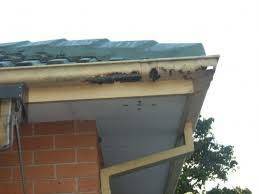 Gutters and down pipes should also be inspected to ensure rusting and corrosion has not occurredd. 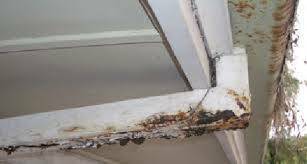 If rusting/corrosion is not repaired in its early stages it can quickly turn into a costly replacement job. 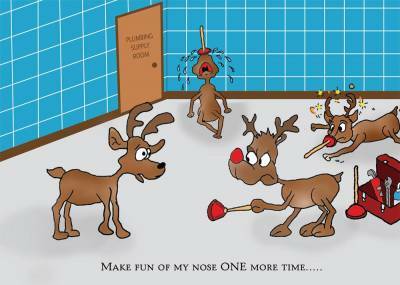 So why not call the roof plumbing experts at AMPS PLUMBING today for a professional advice and maintenance. DOES YOUR BACKYARD LOOK LIKE THIS??????? 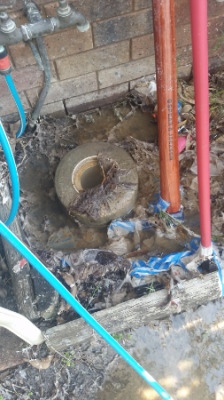 If you find yourself in this predicament, than why not call AMPS PLUMBING today, we are confident that we will come up with a drainage solution for you to avoid water saturation and accumulation or rainwater in your backyard. If your yard is on the lower end of a slope, then rainwater can quickly pool and can essentially become a collection point for water. In Short, water needs to be able to drain off and absorb quickly and easily into the soil. 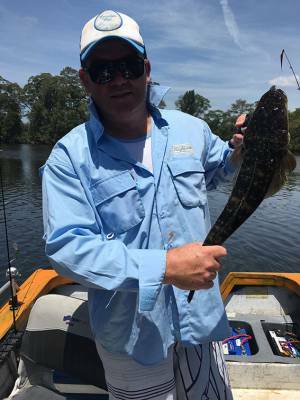 AMPS Plumbing has been servicing the entire central coast for the past 20 years, so you can be assured that with our experience we will come up with the best solution - the first time round!!!! So Give us a call today on 4367 0011. 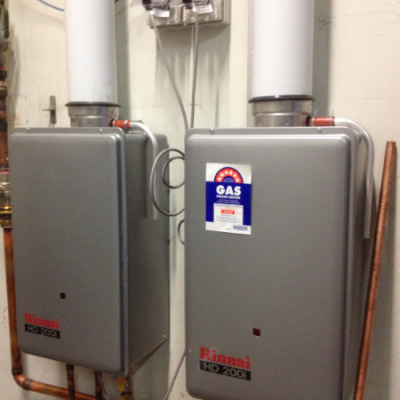 Without question every gas job should be done by a licensed gas fitter. The consequences of a sub standard or defective job could be catastrophic. It is not worth the risk to your family, friends or employees. 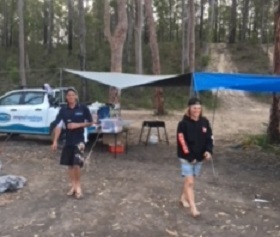 So why not call in the experts on the CENTRAL COAST - AMPS PLUMBING!!! On this job we investigated a leaking bathtub using a Hydrostatic Dye Test, which revealed a small leak coming from the silicone seal around the plug waste which wasn't sitting flush with the bathtub. 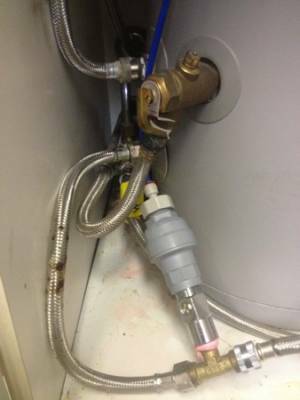 Our expert plumber on the job was able to replace the faulty installation of the waste and re-silicone to fix the existing problem. If you find yourself in this predicament, then call in the professionals at AMPS Plumbing. Our team of plumbers are available 24 hours a day, 7 days per week, so call us on 4367 0011, for all your plumbing solutions. 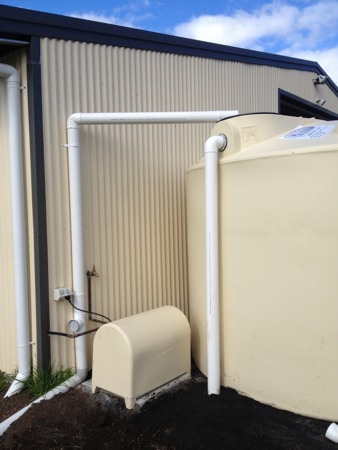 If you are thinking of getting a water tank installed, then now is the time with the winter rain approaching. The rainwater that you have collected in your water tank could be utilized in many ways including watering your plants, flushing your toilet and even washing your clothes, and could save you $$$$ on your next water bill. So why not do your bit for water conservation and call in the Plumbing Experts on 4367 0011. This week we were called out to a job, where water was pooling around the water meter in the front garden. 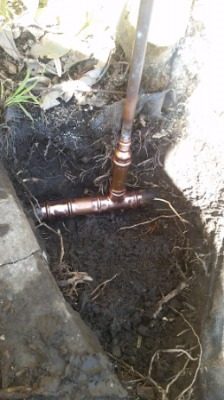 Upon inspection we found that there was a leaking tee joint in the main water supply line.We isolated the water supply and replaced the damaged section. If a water leak/damaged pipe is left unattended often the leak could become worse in a short amount of time, and you will notice a substantial increase to your water bill. 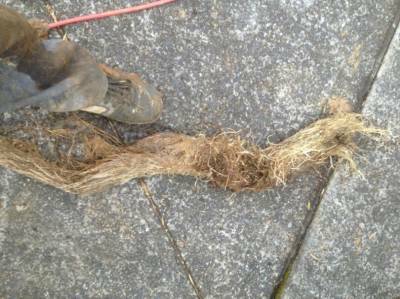 DRAIN AND PIPE BLOCKAGES - Look out for the signs!!!! Flushing your toilet and to have it overflow onto your floor is a nightmare scenario no homeowner wants to be faced with. Typically clogged drains can show early warning signs before a plumbing disaster occurs. Slow draining - a slow draining sink, tub or shower that typically becomes worse over time can be a sure sign of blockage. Foul odours - when a drain is blocked, water, hair and debris continuously accumulate behind the stoppage. Stagnant water and decomposing solids can produce a foul odour that can spread through the air. Gurgling sounds - A drain that is blocked locally can produce a gurgling sound. If you have a main sewer blockage, you may hear gurgling in your shower or sink. Changes in flush water level - A drain clog can change water levels in your toilet, so keep an eye on any changes whilst flushing. So if you suspect your home or business could have a blockage don't leave it till a disaster arises, call in the experts today. HERE AT AMPS PLUMBING WE ARE OFFER A PROFESSIONAL, SAME DAY SERVICE FOR ALL DRAIN BLOCKAGES. Call us on 4367 0011. 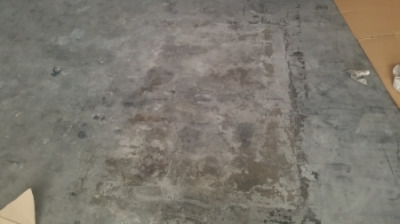 Job of the week - Our client noticed patching and water marks on warehouse concrete slab flooring. We used the latest in water leak detection equipment to pinpoint the water leak under the concrete slab. 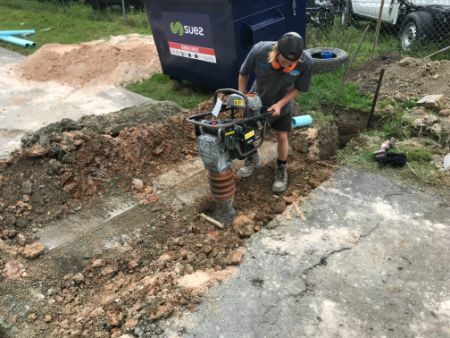 Using a jack hammer we cut the precise section of concrete with the damaged pipe, excavated the hole and found the copper pipe had corroded and needed replacement. 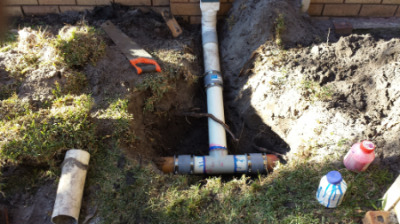 We replaced section and pressure tested the water service to ensure no further leaks in pipe. We then back filled the hole and relayed concrete. 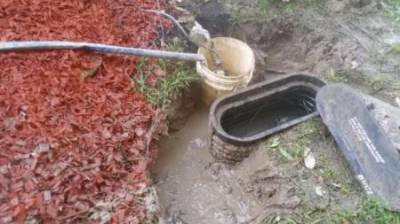 CALL AMPS PLUMBING FOR ALL YOUR BLOCKED DRAIN AND WATER LEAKS JOBS, OUR WORKMANSHIP IS GUARANTEED. Job of the week - Every home owners worst nightmare - a blocked up sewer line!!!! 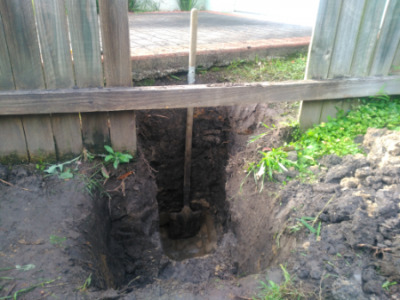 Upon inspection of this job, the sewerage was coming out of a gully in the backyard. We jetted down to the main, where several root blockages were cleared. 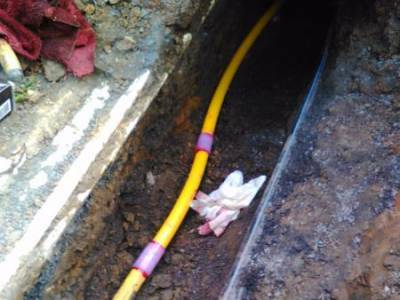 CCTV inspection was also recommended to locate the cracked sections of sewer line, so repairs could be made. 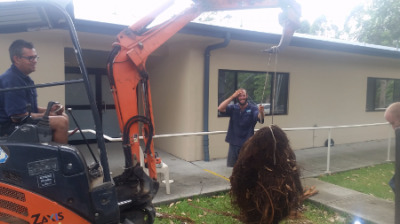 If you are in doubt of tree root damage to your property call AMPS PLUMBING - THE BLOCKED DRAIN SPECIALISTS on 4367 0011. Job of the week - install new pressure piping in concrete driveway. On this job we had to cut along the entire left hand boundary of the driveway. We used the jack hammer and removed the concrete and then excavated a trench along the boundary wall. We then installed new pressure piping to the street and then tested the line for operation. Next we back filled the trench and re-concreted the driveway. We removed all rubbish and left the job clean and Tidy. 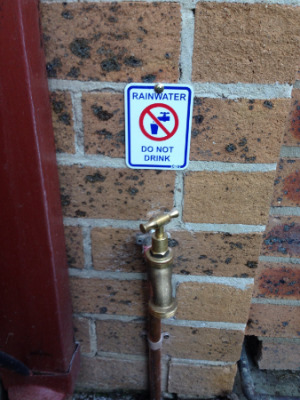 Did you know that under new Australian laws, new hot water systems must now be fitted with a hot water tempering valve. Hot water tempering valves are mechanisms within the water system that can limit water temperature to a maximum of 50 Degrees celsius in your home. 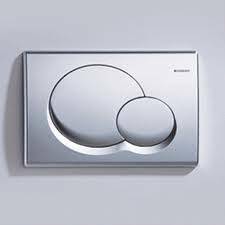 This means the water stream and the plumbing features are made much safer, avoiding scalding injuries from splashing or touching. Each year, thousands of Australians receive burn injuries in their homes from a wide spectrum of sources. But some of the most common burn injuries occur in the home with seniors and children. They are most at risk as they are unable to react quickly enough to turn the tap off if scalding water comes out and burns them. When bathing a baby make sure the temperature is comfortably warm, but not hot. You should test the temperature of the water on your elbow instead of your hand, as your hands are more durable and less sensitive to heat. To play it safe for the safety of your baby, you could purchase a thermometer to check that the temperature is around 37 - 38 degrees celsius, before you put the child into the bath. Your families SAFETY AND WELLBEING is well worth the investment!!!! Before you head off the to the nursery this weekend, you need to consider the full life of a plant!!!! 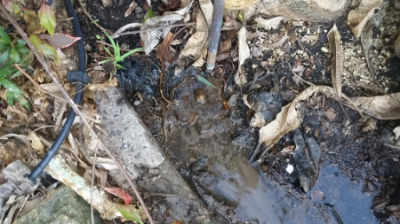 By making smart, educated decisions as to what plants/trees you choose to inlcude in your garden and around your home could save potential costs from blocked drains, damaged sewer pipes, cracked driveways and paths in the long term. 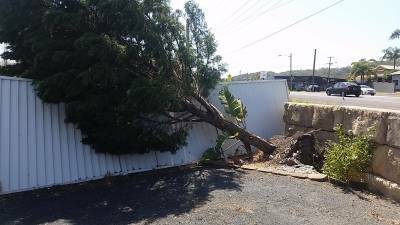 The destructive power of root systems can destroy fences, retaining walls, pool infrastructure and even your foundations in your home. Better choices for around the garden are smaller, slower growing trees and shrubs, which have a shallower root system. You should also avoid planting within 3 metres of sewer drains, and storm water pipes to reduce the risk of incidents. So be sure to chat to your local garden consultant to obtain expert advise before you buy!!!!! 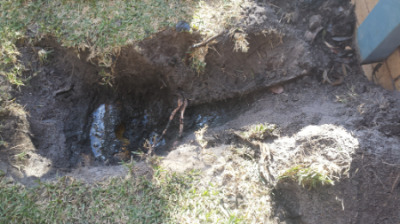 If you find yourself with problems with tree roots, AMPS PLUMBING are the drain unblocking experts. 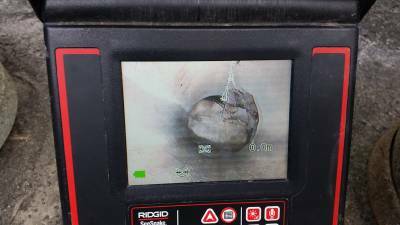 We use the latest technology in CCTV Camera and jetting equipment to fix any pipe/drainage problem. So call us today on 4367 0011. 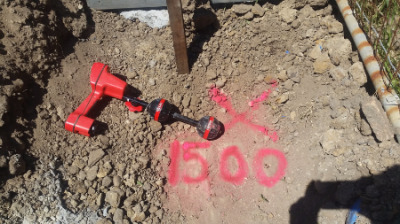 On this job we used the latest technology to quickly find that a tree root had partially blocked a sewer line, we were then able to use the high water pressure jetter to clear the line. 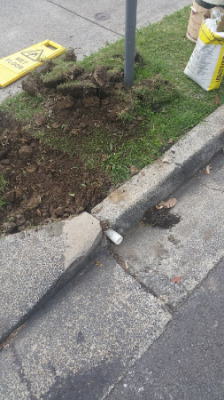 By using the CCTV camera we are also able to pinpoint the exact position of the damaged section of pipe or sewer and repair the section, without messy dig ups that can take time, cost money, and leave you with a mess to clean up. 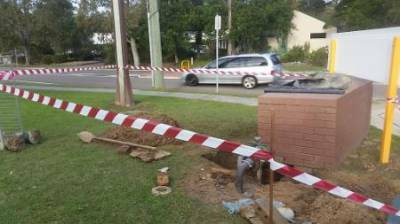 So call the PIPE BLOCKAGE EXPERTS at AMPS PLUMBING today for a quote on 4367 0011. 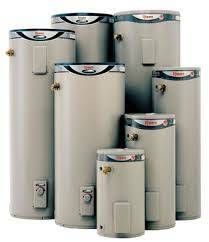 HOW DO YOU KNOW IF YOUR HOT WATER SYSTEM NEEDS REPLACING???? In many cases our hot water system speaks to us before it gets to a critical stage. There can be telling signs that all is not well and the trick is to recognise them and call in an experienced plumber to help. A reduction in hot water or consistent supply. Noises coming from the system including cracking, groaning and even popping sounds. Delays in water heating up. Fluctuation in your gas or electricity bills. So if you think your hot water system is telling you something, our experienced team of plumbers can help diagnose any issue, giving you quality advice about the best way forward, be it repair or renew. So call AMPS PLUMBING today on 4367 0011. Regular checks on all piping and advising when replacement is needed. Regular cleaning of drains, pipes, taps, sinks, and hot water systems. 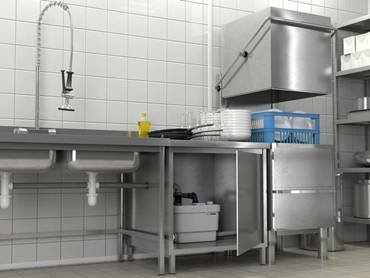 Grease trap cleaning and maintenance in commercial kitchens. Advice on water saving measures that can be put in place. A plumbing emergency can be very disruptive to any business, regardless of its size. Don't risk costly damage and repairs to your business. The cost of repairing or replacing a cracked or weak pipe will be far less than the cost of replacing flooring or equipment, not to mention the loss of productivity for your business when repairs are made. 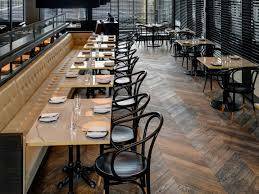 We have experience in in all types of commercial premises including small cafes, large restaurants, shopping centres, office buildings, residential buildings, kindergartens, schools and more. We are available 24 hours a day, seven days per week. So safe guard your business today, and call AMPS PLUMBING today on 4367 0011. On this job our client had noticed bubbling paint in the lounge room which adjoined the bathroom. We carried out a full shower test of internal pipework and tap ware which all proved to be in good working order. 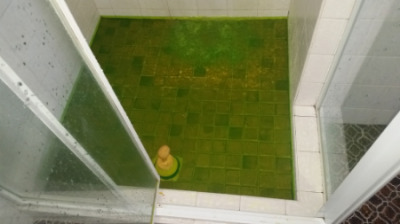 We then carried out a hydrostatic dye test on the shower base, which quickly showed the dye pass thru the wall quickly, the waterproofing in this circumstance proved to be the problem. If you suspect any water leaks within your home, Call in the experts at AMPS PLUMBING on 4367 0011. 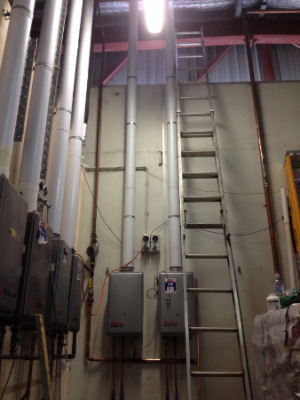 Job Of The Week - On this job we installed two Commercial Instantaneous Hot Water Units for our client. 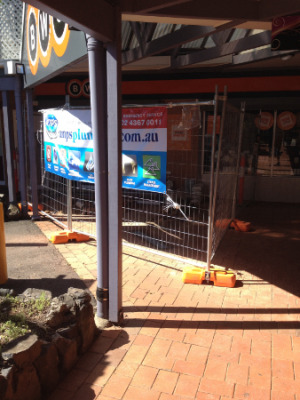 AMPS PLUMBING specialise in all your commercial needs, so call the professionals today on 4367 0011. With all this Rain we are having, have you found water pooling in places it shouldn't be ?????? Upon inspection of this job, the storm water pit on the driveway was blocked up. 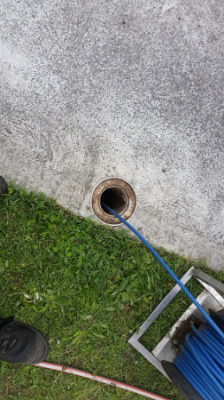 Here at AMPS PLUMBING we use the latest jetting equipment to clear drain pits and pipes easily and without making a mess of your driveway! So if you are looking for a Plumber on the Central Coast call us today on 4367 0011. On behalf of the AMPS PLUMBING TEAM, we would like to wish our valued clients and customers a MERRY CHRISTMAS AND A HAPPY, PROSPEROUS AND HEALTHY NEW YEAR FOR 2016. 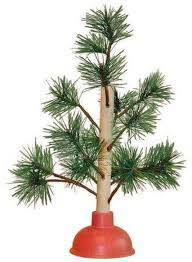 If you have any plumbing problems or issues over the festive period our experienced, professional plumbers will be available 24 hours a day, seven days a week!!! INCLUDING PUBLIC HOLIDAYS. Call us on 4367 0011. 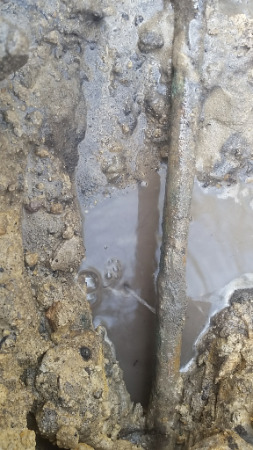 Using the latest in technical equipment we were able to quickly locate a sewer line clogged with tree roots, we then proceeded to clear the line using the water jetter which effectively removed the blockage. If you find yourself in this dreaded predicament call AMPS PLUMBING, we are available around the clock, 24 hours a day, 365 days a year. Handy Tips to keep your drains from clogging!!! Dispose of oil and grease properly. Resist the urge to pour oil and fat down your drains, as this can buildup over time and block your drains. Pour oil and fat into a can or container and place in your rubbish bin. 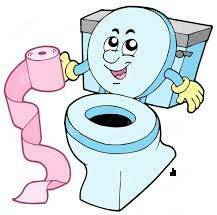 Paper towel can also be used to mop up small amounts of oil and fat before you wash.
Watch what you flush!!! Baby wipes and Feminine Products cannot be flushed down your toilet. This can easily block up your toilet and cause it to backup and overflow. We would also highly recommend to think twice in flushing the new "Flushable Wipes", as they have proved not to be so flushable to a few of our customers. We believe better to be safe than sorry!!! Invest in sink strainers for your kitchen and bathroom. Keep unwanted particles like food, hair and other objects by using a sink strainer. 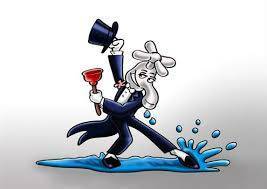 If you have any issues with your drain blockages, call AMPS PLUMBING on 4367 0011, and leave it to the experts!!! We specialise in quickly finding the problem and removing any blockage using the latest equipment. 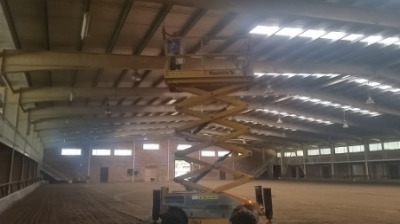 Job of the Week - we replaced sprinkler system check valves at a local equestrian facility on the central coast. 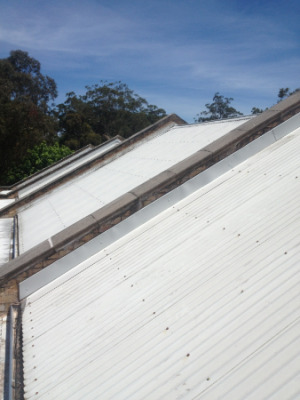 Is your roof ready for the harsh Aussie Summer??? Summer is upon us, so it is time to ensure your roof is ready for the possibility of severe thunderstorms. Inspect your roof - Look for Loose, broken, or missing roof tiles. Keep in mind that high winds can dislodge roof tiles, so it is a good idea to regularly check your roof for any signs of this. 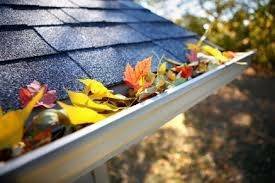 Clean Gutters Regularly - Leaves, branches and debris can clog your gutters and down pipes, which could cause rainwater to backup and cause roof leaks. Gutters with too much weight could collapse and cause costly roof damage. Trim Overhanging Foliage - If trees overhang your house, look for dead branches that hang over your house or yard and remove them, as this will minimize the chance of a limb falling in a storm and damaging your roof. If you require any maintenance to your roof, Call AMPS PLUMBING today for an expert roof plumber to assist you on 02 4367 0011. 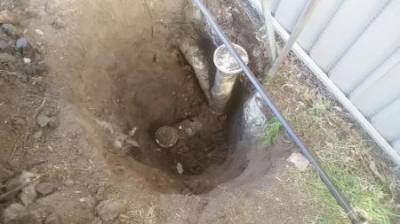 On this job the Tree Root had cracked the sewer pipe, so we were able to quickly detect the blockage using our high tech equipment, excavate the exact position, and replace the broken section. 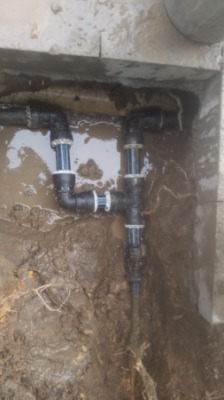 We then concrete encased the new connection to minimise the possiblity of future problems with this section of pipework. Our proffessional, reliable plumbers will also leave your home or office clean and tidy after any job. 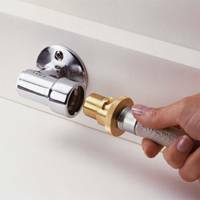 Call Australian Maintenance Plumbing Services today on 4367 0011. 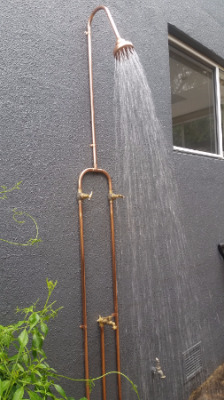 In this instance our clients were having water issues during heavy downpours of rain. The gutters were overflowing and therefore causing flooding at the entrance of the shops. 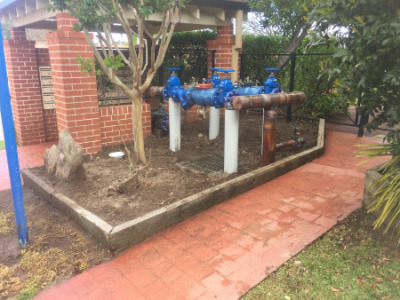 This job included removal of existing pavers, excavating a trench and installation of storm water drainage line and strip drains, concreting the drains into position, and relaying pavers. We were also able to co-ordinate job without jeopardising access for customers during this time. Our Fully Licensed, Experienced Plumbers are able to fix all your plumbing problems!!!! 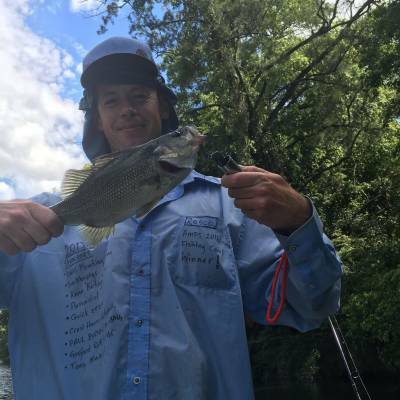 Call AMPS Plumbing Today on 4367 0011. 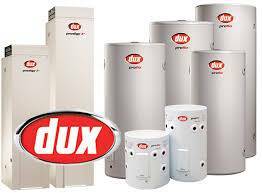 Have you ever thought about installing a water tank??? Do your bit for the enviornment and save $$$$$$$$, at the same time. 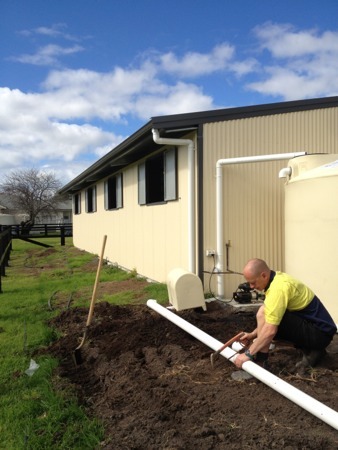 We can plumb your water tank directly to outdoor taps and hoses, to water your garden and top up your swimming pool. Did you know that a toilet will use approx 14% of water in your house, and the washing machine will use about 16%. That is a massive 30% of good quality drinking water used unnecessarily in your home. So why not plumb your water tank to your toilet and laundry???? 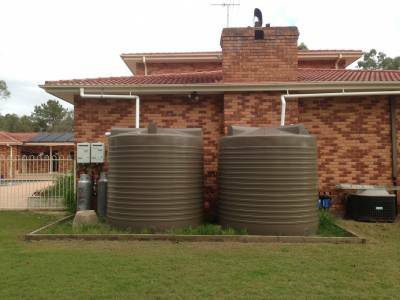 Call Amps Plumbing today on 4367 0011, and let us install and plumb your new Water Tank to suit your family's needs. 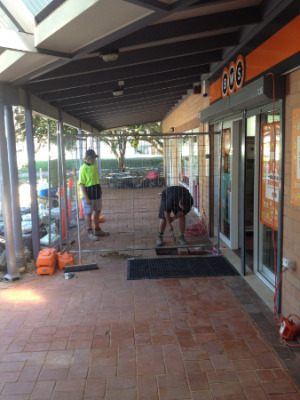 In this instance our client was experiencing water pooling at the front of the main entrance to their store. 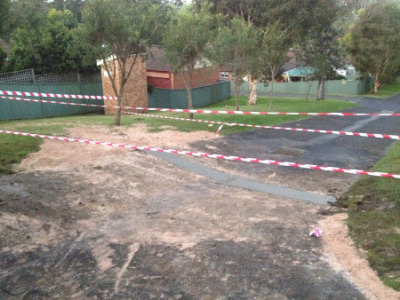 The area in question was approximately 8-12 square meters of foot path/front entry, that was considered a 'low spot'. Unfortunately there was no provision allowed to drain this area upon construction, but thankfully there is a solution available. Six meters away there was a storm water line deep enough to allow us to achieve fall from the front entry to this storm water drain. 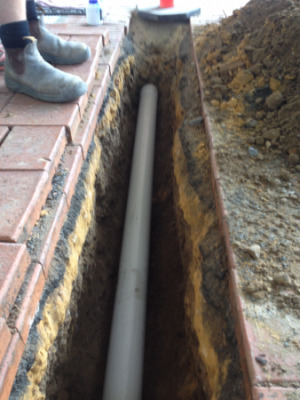 At the front entrance we installed a trafficable strip drain from one side to the other. We had to cut concrete and asphalt to allow the installation of this strip drain and storm water line. If you experience water drainage issues in your home or office, let us find a solution for you. Call us today at AMPS PLUMBING on 4367 0011. Are you experiencing water leaks in your ceilings or walls cavities??? 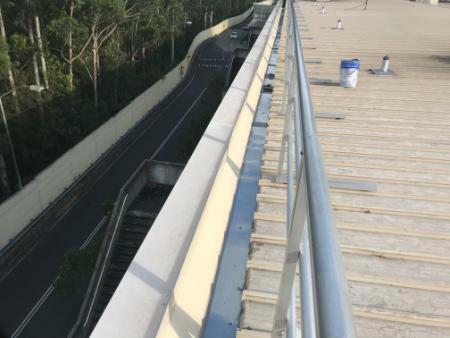 In this instance, the Roof Flashings were replaced on the Parapet walls to ensure that rainwater is diverted onto the roof and into the gutters. 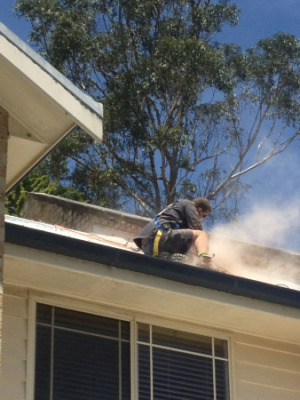 Call AMPS Plumbing Today, our experienced roof plumbers are here to help. 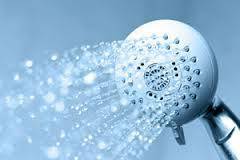 Did you know that a standard showerhead uses at least 120 litres of water per eight minute shower. Whereas a Water Efficient model uses less than 72 litres of water. That is a massive 40% less on the average shower. By installing a water efficient shower head saves about 14,500 litres per average household per year. So do your bit for water conservation and save your hard earned cash!!!!!! Call us Today at AMPS PLUMBING on 4367 0011, and let us help you. 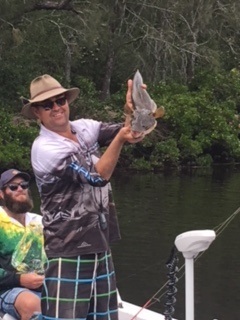 Our Valued Team enjoyed their annual fishing trip away last weekend!!!! 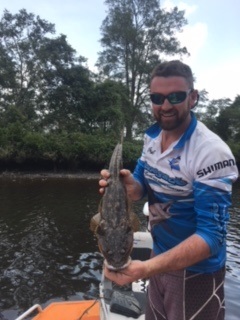 Lots of Laughs, and plenty of fish caught!!!! A traditional single flush toilet can cost you on average approx $76 a year, compared with a water efficient dual flush system which would cost $25 per year. That is a saving of $51 per year, or $510 after 10 years, and of course you will be doing your bit to conserve our precious water supply!!!! Call AMPS PLUMBING, and let us help you save today. 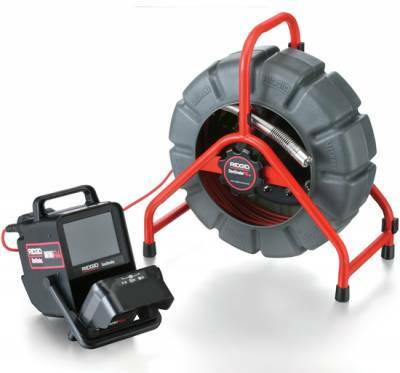 Here at Amps we use the latest technologies to locate broken sewer and storn water lines. Here at AMPS we specialise in emergency plumbing 24 hours per day, 7 days per week. In this instance a tree has fallen in the front yard, damaging the water supply meter and pipework. If you find yourself in this predicament, give us a call. 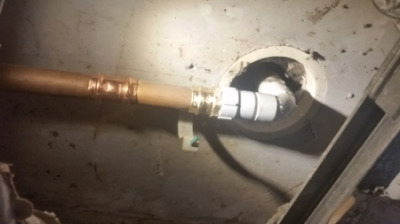 On this particular job we found an illegal installation, the picture shows the connection from the shower hooked up with a standard hose, we also found the venting was insufficient, and in this case it does not meet the necessary Australian Standard requirements. Our highly experienced plumbers will fix any problem!!!!! 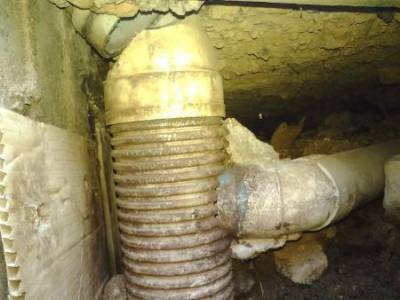 If you have any doubts that your plumbing is insufficient or you notice any water leaks, call AMPS today on 4367 0011. Our Homes are full of pipes that bring water in, make it usable and then take it away. 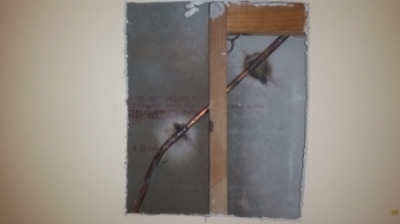 It is this vast network of pipework that makes it difficult to detect a water leak. Increased Water Bill - One of the easiest ways to tell that you have a water leak in your plumbing system is if you have seen an increase in your water bill, without an increase in water usage. Low Water Pressure - A great way to determine if your home is suffering from a water leak is if your faucets or shower heads have low water pressure, either sporadically or constantly. Sound of Flowing Water- If you hear flowing water when all taps and faucets are turned off you may have a water leak.The sound may be heard in wall cavities, or under the floor. 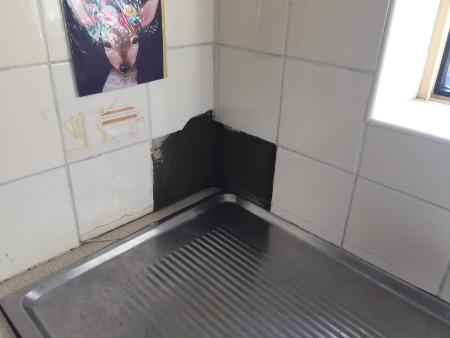 Wet Spots on Floors and Walls - If you notice wet spots on your floors, walls or ceilings, depending on your pipework than there is a good chance that you have a water leak. Here at AMPS PLUMBING we use high tech water detection systems to quickly and efficiently find any water leaks and repair, minimising any damage to your property. Call us today on 4367 0011. 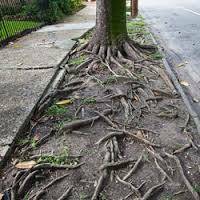 Tree roots can block or partially block your drains, pipes and sewers, leading to sluggish drainage or discharges onto your property or surrounding properties, or even inside your home. Here at AMPS PLUMBING we have the specialised equipment for all plumbing jobs. 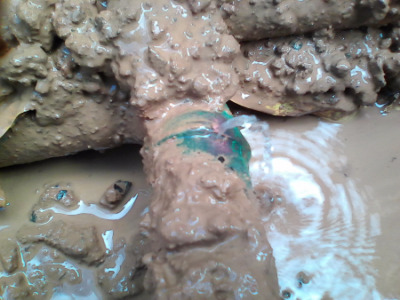 Our high pressure water jetter was used in this instance to clear and remove the blockage. Ensure your family and co-workers are safe!!!!! Finding a plumber isn't a difficult task, but finding an efficient and professional plumber is not easy. Here at AMPS Plumbing we provide efficient and experienced plumbers who solve all your plumbing problems like leaking pipes, blocked sewerage, and burst pipes for instance. 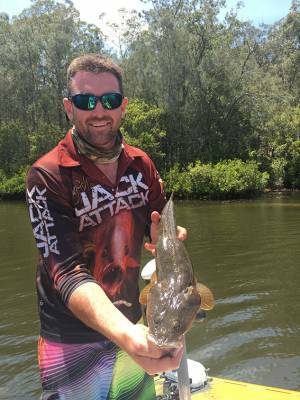 We are an Australian owned and operated business. Dedicated to servicing the plumbing needs of strata, residential and commercial properties with quality workmanship and efficiency, we are a trusted and reliable name. CHECK OUT OUR NEW WEBSITE!!!!! You can now book all of your plumbing jobs online, no need to pick up the phone!! We will guarantee a follow up a phone call by 9.00am the following business day. Fast and Reliable Service 24 hours a day, for all services including Blocked drains, Water Leaks, CCTV and general plumbing maintenance.